You already own eSATA drives, but can’t connect them to your new Mac. The eSATA Hub modernizes your drives and puts them back to work. You don’t have to buy new drives and scrap the old ones. eSATA and Thunderbolt connections are even software RAID compatible. 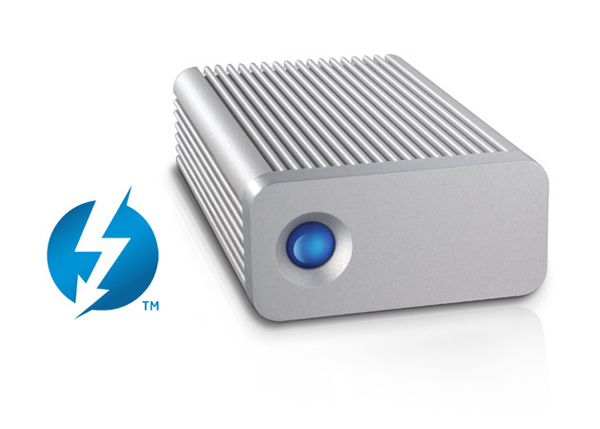 Upgrade your storage with Thunderbolt technology. 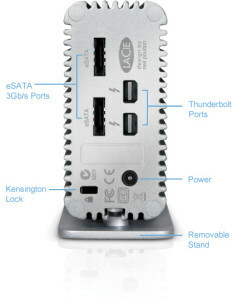 Thunderbolt technology supports daisy chaining, so you can connect a display or other Thunderbolt device to the eSATA Hub. This means you can connect, for example, your high-end LaCie 324i display and your eSATA Hub to your Mac via a single Thunderbolt cable. Thunderbolt technology also supports two channels – one dedicated for data, and the other for video – each with 10Gb/s of bandwidth. This means you can push and pull audio/video data without reducing bandwidth. Maximum convenience, minimum desktop clutter. Weight : 505 g / 1.11 lbs. Better speeds, better value. With the eSATA Hub Thunderbolt Series, now you can connect eSATA drives to your Thunderbolt-compatible Mac. Connect up to two drives to the Hub, which connects to the Thunderbolt port on your new Mac*. The eSATA Hub is the perfect solution for companies that use eSATA drives, but have upgraded their Macs to versions without ExpressCard/34 slots. It also offers a great way for photographers or other creatives to boost eSATA drive performance. The ExpressCard/34 maximum bus speed is 2.5Gb/s, which limits eSATA 3Gb/s transfer speeds. The eSATA Hub clears this bottleneck, since Thunderbolt’s 10Gb/s provides more than enough speed to accommodate 3Gb/s. Achieve the full speed potential of your eSATA drives.